Both optical fiber and coaxial cable are the types of guided media. But some major factors exist that differentiates the two. The crucial difference between optical fiber and coaxial cable is that an optical fiber is used for the transmission of the optical signal. As against, a coaxial cable is used for the transmission of an electrical signal. Transmission speed High Comparatively low. Noise immunity It exhibits high noise immunity. Coaxial cable offers low noise immunity. Effect of external magnetic field Transmitted signal not get affected by external magnetic field. The transmitted signal gets effected by external magnetic field. Transmission distance Signal is transmitted to larger distance. The signal transmitted is restricted to comparatively smaller distance. Cost Expensive. Comparatively low in cost. Security It offers secured communication. The security of transmitted signal is not guaranteed. Size and weight Thin cable diameter and low weight. Thick cable diameter and comparatively heavier. Optical fibers are waveguides that are used for transmitting optical (light) signals from one end to another. 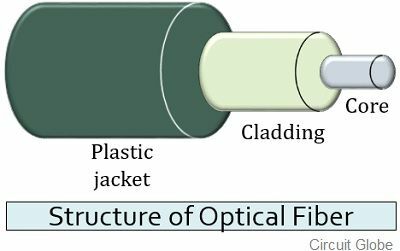 Optical fibers are basically made of glass or silica is a combination of core and cladding. The core is the inner portion the fiber made of very pure silica glass which is surrounded by a glass cladding. And protection from external wear and tear, this whole fiber assembly is enclosed in a plastic jacket sometimes known as buffer coating. A signal through an optical fiber is transmitted through total internal reflection. Basically, when the light is allowed to transmit through an optical fiber, then in order to transmit, the signal undergoes successive reflections from the cladding thereby travelling through the core. In the case of the optical fiber, necessarily the refractive index of the core must be more than the cladding so as to have total internal reflection. We know the principle of TIR that when light enters a rarer medium from a denser medium with the incident angle more than the critical angle. Then the incident ray gets reflected towards the same medium. This principle is utilized for transmitting an optical signal through an optical fiber. The ray is allowed to the incident the core but due to variation in the refractive index the ray despite reaching the cladding, reflects towards the core. These continuous reflections cause the transmission of light from one end to the other. Coaxial cables are also known as coax and are guided media that are used for transmission of electrical signals to some distances. Coaxial cables are basically conductors that allow electrons to flow through it. Mainly copper is used in the manufacturing of coaxial cables. Here a flexible strand of copper is taken over which a dielectric insulator is surrounded. And this whole arrangement is enclosed in a metallic shield over which a plastic jacket is placed for protection towards environmental factors. 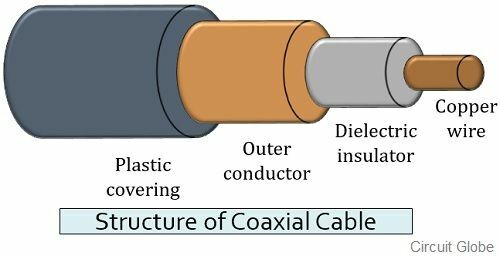 It is given the name coaxial because the inner and outer conductor have a common geometric axis. The electrical signals which are required to be transmitted through the coaxial cable are provided at the centre conductor. Also, the insulating medium confines the generated electric and magnetic field within the conductor. An optically transmitted signal undergoes less attenuation as compared to an electrical signal transmitted through a coaxial cable. Another important difference between the two is that an optical fiber cable offers high transmission speed. While the signal transmission speed is comparatively low in case of coaxial cable. Optical fibers allow the signal transmission to longer distances as compared to the coaxial cable. In an optical fiber, the transmitted signal is not affected by the external magnetic field. While in the case of coaxial cable, the transmitted signal gets somewhat affected by the external magnetic field. Installing an optical fiber is a difficult task in comparison to the installation of any coaxial cable. The bandwidth utilization factor for signal transmission is very much higher in case of optical fiber than a coaxial cable. An optical fiber cable is more immune to noise and other environmental effects as compared to a coaxial cable. The coaxial cables are low-cost cables whereas, fiber cables are expensive. Optical fibers are more efficient as they allow long distance as well as fast signal transmission. While coaxial cables are less efficient. Optical cables are lightweight cables whereas coaxial cables are somewhat heavy in weight and are comparatively thicker than optical fiber cable. It is used to transmit signals of optical frequency, thus finds applications in HDTVs, aircraft and in the medical field for the surgical purpose. It is used to transmit radio frequency signals, hence finds applications in cable TV signal transmission as well as in internet and telephone connections. Both optical fiber and coaxial cable are used for signal transmission. However, different types of signals are transmitted through both cables. Hence the two holds use in distinct fields.